Collins holds a PhD in Genetics (Infectious Diseases), a Masters of Science in Cell and Molecular Biology and a BSc all acquired from Kenyatta University, Nairobi, Kenya. He is a Professor in Biomedical Sciences at Maseno University doing research at the APHRC. 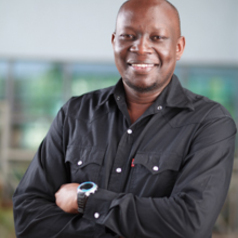 Prior to joining APHRC, he was also Director of Research, Publications and Innovations at Maseno University, Kenya. In collaboration with the Kenya Medical Research Institute and University of New Mexico, Albuquerque, USA), Collins designed and participated in a major project on the genetic basis of severe malarial anaemia in children resident in western Kenya. He has also worked on other projects in health systems, drug resistance genes and general public health. Collins won the prestigious and coveted Royal Society Pfizer Award for being the best African scientist in the year 2010.